You can totally join us on the Path to Freedom. I believe that life is meant to be lived free. Free of debilitating stress, needless suffering, creative oppression, rampant disease and financial constraints. This is why I have aligned with the Essentials for Living Team using DoTerra’s plant medicine and home health care company. Being able to use medicines that support small scale farmers from around the glove, to alleviate health issues and empower people to be their own bosses is AMAZING. I’ve fallen super in love with DoTerra as a company as well as their incredible products. I use their oils, supplements and beauty products and lead a team of over 300 customers and leaders who are also aligned with this mission. This page is for you if you’re ready to experience the powerful plant medicines that are doTerra essential oils. There are three options to choose from to get starting receiving the benefits of Essential Oils! This choice, purchasing at regular retail price is for those of you who simply want to try one or two items. If you are hesitant and really need the experience of a single oil to test and use, the wholesale discount won’t be worth it in this case. It's simple, just visit my personal doTerra shop here. Enjoy your order! (Now, if you do really just want to try one or two oils, let me know and I am more than happy to send you a sample). Option 2: Wholesale – you get 25% off! With option 2, you benefit by receiving 25% off of all products. There is no requirement to spend any amount, or to buy every month, or to sell anything, ever. Very similar to a Sam’s Club or Costco membership (but better), because you can receive the membership for FREE when you buy a starter kit (yup, even the smallest one)! Simply sign up here with my Sponsor ID, 5899598, and choose ‘Wholesale’. See details on the kits here *American kit (this will open in a new tab so you can browse). Read my recommendations on which kit to choose below in the FAQs. Choose your products ‘a la carte’, and the $35 fee will be added. Membership renewal costs $25 after the first year, but you receive a free bottle of peppermint when you renew, which is worth $27 retail. Awesome right? Option 3: Get free products and/or build a wellness business! Just sign up here with my Sponsor ID, 5899598, and choose ‘doTERRA Wellness Advocate’ in the Account Type section. Choose one of the kits as your first product and the $35 membership fee will be waived. See details on the kits here ** See option 2 section for Canadian or UK kits! (this will open in a new tab so you can browse), or check out my recommendations on which kit to choose below in the FAQs. Be sure to get in touch with me and let me know you’ve enrolled, so I can give you some pointers on how to build a thriving wellness business with this simple and effective business model! We will go over how to set up a monthly LRP (Loyalty Rewards Program) order. You can change the order every month, and change the date it ships as well (very flexible). If you want to build a business and earn commissions & bonuses you will invest around $100 (100 PV) per month. This is such a small overhead for owning your own business, having your website built for you, AND covering all your health & wellness, personal care and home cleaning products. If your order is over approximately $125 (125 PV) and ships before the 15th of the month, you’ll get the free product of the month! Natural Solutions Kit for a whole health & medicine cabinet makeover! As for the monthly order, it's awesome, because TRUST ME, you will become obsessed with these products and want to try all of them! Investing around $125 per month to have everything that comes with the business AND receiving products for the investment, it's really a win win win. When building your business with doTerra, you can consider your LRP order as your ‘stock’ for the month. In order to share or empower others to use ANYTHING you need to be familiar with and passionate about the product. Building the business is easy and fun with doTerra as long as you are engaged, passionate, in alignment. 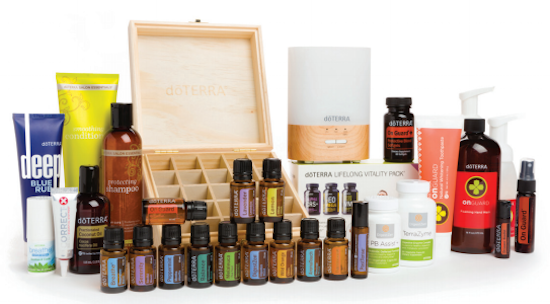 Q: All the doTerra enrolment kits look awesome, which kit do I choose? For most people starting with essential oils, I recommend the Home Essentials kit to start with, it’s a great deal with 15 mL bottles, plus the diffuser so you can use your oils aromatically! It’s a much better deal than the Smaller kits, as the bottles are only 5 mL and you don’t get the diffuser with all of them. The first kits can seem 'cheaper' and tempting, but it's not as great deal since you can pay a little more for the Home Essentials, and get 3x the oils, plus a diffuser. Having a diffuser is massive in how you use oils on a daily basis to support energy, immunity, stress relief and positive mood! If you are looking to detox or cleanse to start off with, for example if you have energy, digestion or Candida issues, the Cleanse & Restore kit is a great option, and you’ll probably want to add some single oils as well, which you can do. Certainly add at least Lavender, Peppermint and OnGuard to this, or you can add those to your next order. If you want the lifestyle makeover and are committed to your health, the Natural Solutions kit is a great way to INSTANTLY & COMPLETELY detoxify and reset your home and medicine cabinet!. I am here to help you learn how to get the most out of these products! Q. If I enrol to purchase products at wholesale prices, does that mean I have to sell dōTERRA? Nope :) You have the option to make a commission and residual income by enrolling others if you so choose (and I'm here to support you to do that), however, there is no requirement or pressure to do that. You can personally enrol just for the benefit of the 25% discount. Q. How much does it cost to enrol? Q. How much does the membership cost each year after the first year? Q. Why is there a fee to sign up with doTERRA? It's quite similar to a Costco or Sam’s Club membership. You pay a membership fee to be able to shop at their stores and purchase items at a wholesale price that you can’t purchase other places. dōTERRA is the same, except that the products are shipped right to your door! Q. What is an enrolment kit? An enrolment kit is a collection of products that dōTERRA has put together, so that you can try some of their best-selling oils without having to guess at which ones you need. Purchasing one of these kits when you enrol already waives the 35$ enrolment fee. Q, Do I have to purchase an enrolment kit when enrolling? Nope. You can pick and choose what you want, “a la carte” style, instead of a kit, if you choose. By doing it this way, you are charged the $35 enrolment fee in addition to the products that you’ve added to your cart. Q. Do I have to place an order every month? Side note: I enrolled with the every oil kit and loved the oils so much that I placed another order the same month (supplements) so I could get extra free products and then I have placed 1-2 orders every month since! The products work that well! Q. Is this MLM/Network Marketing? Some product brands choose to use their marketing budgets conventionally, paying for advertising and trying to get their products onto all sorts of shelves and in big stores. Others pay individuals to spread the word about the product, giving them a commission of sales. That’s a really simplified explanation, by the way. I am certainly not a pushy network marketer, I DO NOT believe in being slimy or salesy or greed-driven and I choose team members who are not either. My value system is this: be in ALIGNMENT, care about helping, healing, supporting and sharing with love. Discounts. I’ve joined a couple of network marketing companies in my day, mainly because it means I get a product I really like at wholesale prices. Oh, and I get paid when I share it with others, that's not the case with other products I use on a regular basis. Community. I like the community aspect of network marketing because I love people and tribe. I love teaching and helping other people be successful. This is an amazing opportunity to be around epic humans and share in the abundance of the Universe. Support and Coaching. This model is what I feel to be the best way to get support with building a business, without paying hundreds or thousands of dollars for help from a business coach. Even if you paid someone, they would never be as vested in your success as a DoTerra Sponsor. Eventually the course or sessions you paid them for would end, and that would be it. But your Sponsor is in the game with you, because if you don’t win, they don’t win. As a team we motivate and encourage each other to succeed! Q. What if I don't know many people? Can I still do the business? Q. What is the compensation plan like? To learn all about the 6 ways you get paid for sharing this powerful plant medicine, click here to watch the simplified video! Absolutely! Sure, it helps if you have a network already, but if you don't, we give you the tools, systems, structures and support to create one! There is full business trainer involved with this business, so you are set for success no matter how large or small (or even non-existent) your network is. Shipping charges vary by country, but for me to Canada it’s $12.99. I’m pretty sure it’s similar for every international order (outside of the USA). In the U.S. shipping is only $3.99. However you get your shipping fee back in free product points, which is so awesome (I mean, who else does that?). Q. Should I join Samantha's doTERRA team of Lifestyle Alchemists? Join my team of Lifestyle Alchemists and help make a positive impact on the planet! I am here to teach you how to get a wholesale membership like myself, earn oils for FREE every month and support you on the path to making a great income in a purpose-filled business that will support your needs and desires. When you join our team, you will connect directly with myself and other like-hearted people, while helping others create a healthy, happy & abundant life! Interested in joining Real Life But Better's Essential Oil Tribe? Check out my contact page if you’re ready to get started right away! Just message me to share your goals and any questions that you might have! Very excited to co-creating and collaborating together! Want to know more about doTERRA?